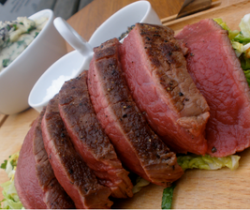 We have found this amazing recipe for Venison with black pudding recipe from Game to Eat. For more great ideas and ways to use game visit their website. Add the hot mash, black pudding and parsley together and set aside. Saute the cabbages and leeks then set aside also. Sear the steaks in a hot pan, season and add a little butter and place in a hot oven 220ºC for 2 minutes. Remove from the oven and rest for 5 minutes before slicing. Correct the seasoning and serve with the wilted greens and black pudding mash.